Our year round bunch brings flavors that need no special occasions and can be enjoyed any day and time. You should have no trouble finding these at the finest beer retailers throughout Northeast Wisconsin and beyond. We are extremely excited to be bringing back some favorites from prior years as well as introducing some new beers as well. Some beers are also available in packaging options not previously offered. Look especially for a unique offering of beers perfect to compliment warm Wisconsin summers. These beers are offered on a semi-regular yet sometimes sporadic basis due to limits on special ingredients and the additional time it takes to carefully craft these fine ales. 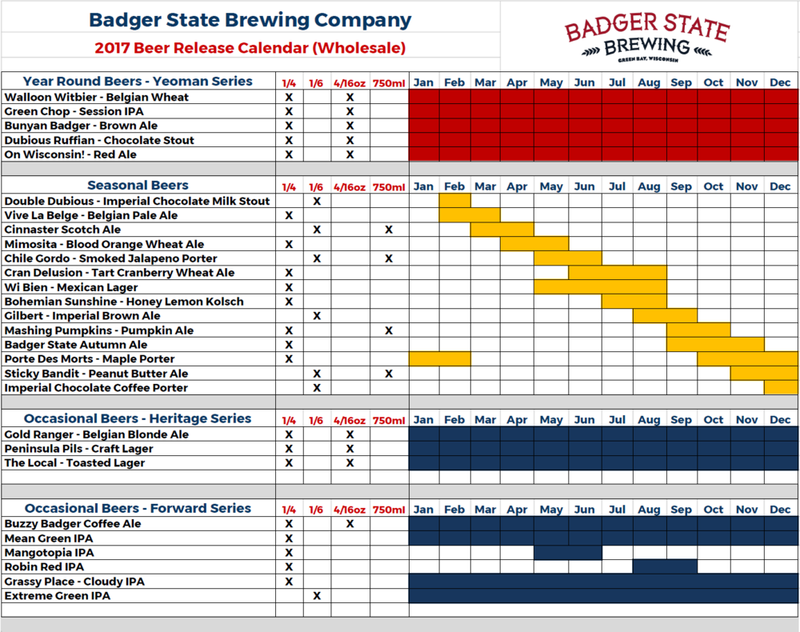 We feel these beers will nicely round out our core and seasonal offerings as well as add some fun to the Wisconsin beer scene. These beers will all be available in the brewery tap room as well as special events and retailers on a limited basis – get at them before they’re gone! Buzzy Badger Coffee Ale (D&16oz) – We will offer Buzzy Badger in distribution for the first time ever! Extreme Green IPA (D&750ml) – Took a hiatus in 2016, back this year bigger and better than ever. Grassy Place – Hazy IPA (D&750ml) – Extremely excited to unveil our version of the “Hazy IPA”! Peninsula Pils (D&16oz) – Light drinking and insanely crushable yet made with quality ingredients. Tailgate At Badger State This Football Season!